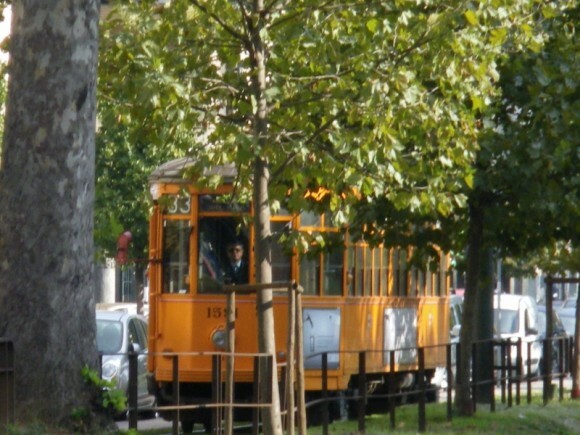 Personally I don’t know Milan well: this is a guest post by an ArtTrav reader, Patricia, who had commented on another article on this blog, from which followed some correspondence in which she declared that she loved Milan, and had chosen to live there on her own, not for a man, but for the city. I love her story. A love story for a city. Here it is. I am in love. Nothing special, if this love wasn’t a city. A city that many people associate with the adjectives grey and boring. How sad, to hear such accusations! With this article, I would like to invite you to take another look and to hopefully intrigue you to have a little flirt with my love: Milan (of course, I mean the city center, not the outer districts which indeed are horrible and grey). But how can I make you see what I see? Imagine you are in love with the man/woman of your life, and someone asks you: what is so special about this person? You will look at the beloved with kind of confused incomprehension, and say: well, it’s simply all about him/her. And if the other insists in asking you, and you start describing his/her features with poetic words, you might hear: well, there are plenty of other men/women who have also these features. And you will then try to describe the way he/she is. But how can one describe the essence, which makes a person unique? Or, in our case: how can one describe what makes a city unique? What makes us feel a certain atmosphere? How can atmosphere be described? and will this feeling of atmosphere be subjective or can atmosphere be described also by objective elements? While this might remain in your reflection, put on a comfortable pair of shoes; open up your mental eyes; allow for the curiosity you had as a child, and jump into my 10 reasons Milan is not just a grey and boring city. Discover the magic of beige, especially in the evening, when the facades are illuminated. While grey appears cold, and creates a sort of distance and boredom, you will find that the dominant colour of the “palazzi signorili” in the center of Milan is a light beige, which is a warm, vivid tone, most atmospheric and soft when illuminated at night. Look at Porta Venezia in the evening light, and you will see what I try to say, or visit the very center, Piazza del Duomo. If you choose daylight, you will discover that many houses have warm pastel colours with a touch of light beige, conferring vivid individuality but at the same time granting for soft harmony. You might stroll around streets like Via Stoppani, Via Melzo (where you will also find several magnificent liberty buildings), or the district around via Tadino (all close to Porta Venezia), to find out, and to feel the beauty of Milan’s colours. Milan is dominantly built in the elegant eclectic style. 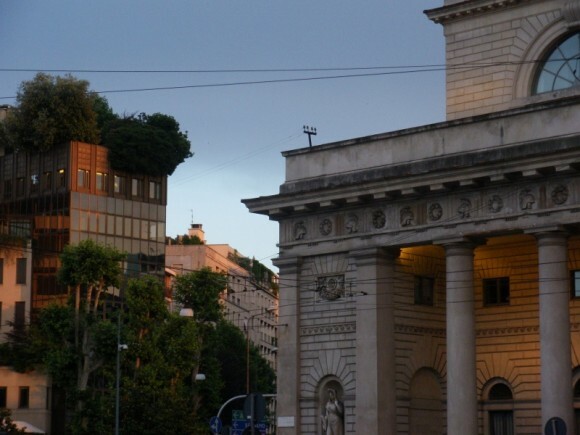 Also typical for Milan, the rustication-style (bugnato), which allows both for eye-distraction and calm harmony. There are purists that hate eclecticism; or others that prefer the Spartan Bauhaus style. Well, those might not feel happy in Milan. But if you are one of those like me who would have preferred to live in the end of the 19th century, with sophisticated circles of Bohemians where Chopin is played and Heinrich Heine read, and if you imagine the spirit of this period transformed into architecture, then you might fall in love with Milan. 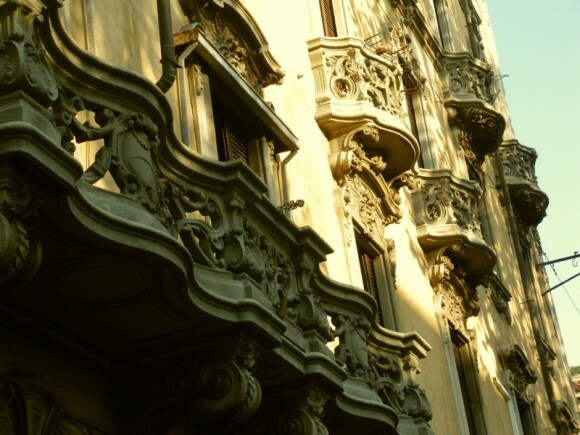 Most of the houses in Milan centre have wrought-iron balconies, or balustrades made of stone columns, decorated with exuberant Mediterranean plants. There are also plenty of roof gardens; just look up. Also the windows deserve attention, usually adorned with shades and tympanum, making me think of the glamorous eyelashes and stylized eyebrows of a Milanese “signora”. Could ever walking between such female houses feel grey and boring? For the balancing masculine touch, you will see huge wooden doors, enabling you to enter even with your horse carriage. Passing such a door, you will feel important like an emperor. Don’t miss the interiors: at evening, when aristocratic palaces are illuminated inside by their magnificent chandeliers, you will discover amazingly decorated ceilings and walls (e.g. Corso Porta Venezia). While walking alongside the palazzi, make sure to have a look at the courtyards. You will be surprised to find behind wrought-iron gates little oases, with sculptures, palm trees and other exotic plants. Internal doors and windows, beautifully made of stained glass which elsewhere could be seen in churches, show traces of liberty. Study the proportion between the height of the houses and the width of the streets: like a picture that you see best from a certain distance – standing neither too close, nor too far away – streets like Corso Buenos Aires, or Corso Venezia gain elegance by the fact that the width of the street is more or less equal to the height of the houses (3 floors). You might find out how this distance-height-ratio effect feels to you. You have free sky above you, which gives a sensation of freedom, and a panoramic view, while the other side of the street is still easy to reach. For the panoramic view, Milan has a “trick”: the width of the streets changes. Looking from Corso Buenos Aires to Corso Venezia, the latter is narrowing to the end, with the effect that you can see the whole line of “palazzi”; in a straight, equidistant street this is not possible. You find this playing with distance also in Via della Spiga, creating a slightly curvy line of buildings, without the street being so curvy. As straight streets tend to feel boring, the variation of street widths adds balanced vividness to the street feeling. The nostalgic charm of the inside wooden trams of the 1920s with all the squeaking, shaking and bell ringing will make you feel like in golden ages. Do you remember the little trains in amusement parks for small children? It’s like that. Just enjoy. And think of how sterile feel modern trams. For lovers of art-house films, you have the fantastic cinema “Spazio Oberdan” (again, at Porta Venezia), but also several (!) other art-house cinemas. Kim Ki-Duk, Fassbinder, Bertolucci, or recently a focus on Picasso; all what is “cinema-art”, you will find here. There is also a small space for expositions, which are also special. 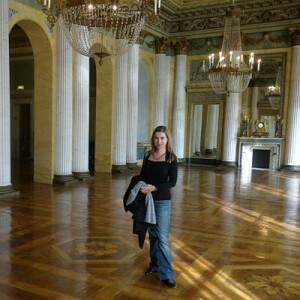 Of course, if you can, you should visit the opera house; not just for the spectacle, but for the building itself. From outside, it does not reveal any of its beauties. These are inside. Those who cannot afford access: there are introductions to the events, by famous choreographs, critics and professors, for free, IN the Scala. If you love classical concerts: the offer is so huge, that it is sometimes difficult to choose. Milan is still (luckily for me) “conservative”, so if you like a repertoire of classic to late romantic/impressionist music (i.e. from Mozart till Debussy), then you are in paradise here. What is special: there are plenty concerts with renowned artists, for 0 – 5 EUR. And it will not be overcrowded. As many as you want. 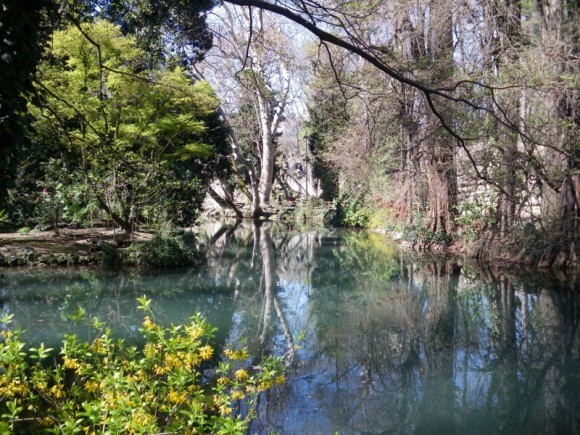 My personal favorite: Galleria d’Arte Moderna (free entrance), which however is not modern art, but a gorgeous villa, in a romantic park with a temple, and as only very few people go there, the atmosphere is special. Extraordinary expositions with the typical Italian mise en scène (which guaranties a full immersion into art, combining paintings with writings of the artist or philosophers of his time, atmospheric light/video installations and background music of the epoch), you will find in Palazzo Reale. Also to mention, the many book presentations of La Feltrinelli; the open air theatre la Verdura (Via Senato), offering spectacles in a romantic park with a temple, for free, or the many other presentations, lectures, often held in the splendid halls of the many historic buildings. Also, all for free. Lovers of poetry might go to Palazzina Lliberty, a splendid liberty construction, with almost weekly poetry readings (again, for free). 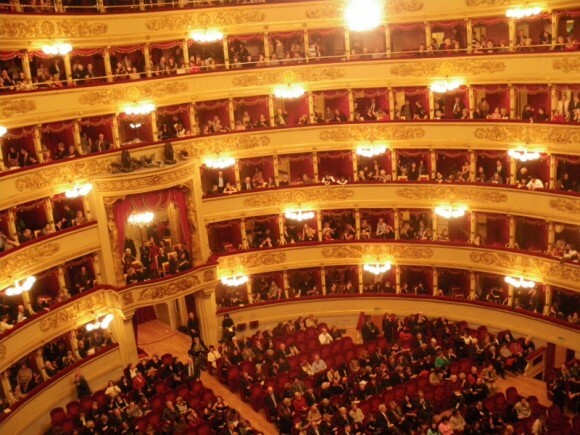 The way they appear in Milan, they could be part of a live performance: the theatre of life. You will immediately note the top-fashioned women with short skirts, high stilettos and make-up, which transform the streets into a reality catwalk; and you will see them wearing these catwalk outfits even when they go for a ride on a motor bike! It’s like looking at the front page of Vogue, or participating at a glamorous photo shoot – but turned into a reality movie. Personally, I like being spectator of this street theatre (even I will always just remain spectator). But it is vivid. It looks colourful. And it feels full of life. There would be plenty of other things to mention, from the Navigli, the channels with the many art galleries and pubs, when on the “Navigli in fiore” day they are all over decorated with flowers, till the group of flamingos, which live voluntary in the garden of one of the villas close-by. But I better stop here. What remains: take the chance to build your own, independent opinion. Not everyone has the same taste. But to me, my love will always remain: beautiful. Simply, for what it is, and gives to me. About the author: Patricia Gomez-Diaz (born 1968), a German living in Milan since 2005, graduated in both Ancient Greek, Latin & Philosophy (M.A.) and in Business Administration with focus on applied mathematics. She works as a freelancer, linking analysis with creativity and the development of strategic concepts; which however remains subordinated to her main interest: Italy and it’s beauty in landscape and fine arts.